UK wide reputation for the highest quality Restoration, Repairs and Award winning Customisation of classic vehicles. We love to share our enthusiasm for restoring and customising classic cars, motorbikes and campervans. That’s why we work hard to maintain a reputation for the highest standard of quality and make sure you will receive a friendly and professional service. Our team of experts have been repairing and servicing classic cars for over 20 years, with a dedication to keeping your vehicles looking good and running smoothly. 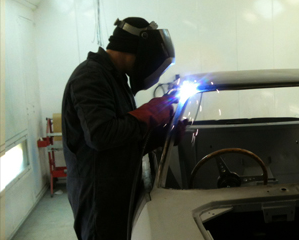 We offer a complete restoration service and can rebuild vehicles from the inside out. We’ll help turn your much loved but tiring VWs Beetle, campervan, classic car, motorbike or scooter into something that will turn people’s heads and make your classic vehicle feel like new again. We also specialising in accident repairs restoring damaged vehicles to their original standard of quality. Specialist classic VW Beetles Servicing & Restoration, Friendly & professional service. View a complete list of all our restoration & repair services.